As far as trail walking goes, Atlas 10 Series snowshoes are one of the best models you can get, not only for its performance but also for its price. The manufacturer claims they’re ideal for all terrain condition. In our view, however, they’re best used in rolling hills and meadows. You can find a lot of snowshoe trails across the states in this type of terrain. The snow is mostly groomed and packed and there’s a bit of moderate slopes in here and there. That’s exactly where these snowshoes shine on. We’ll walk you through the nitty gritty stuff that makes Atlas 10 Series, though not perfect, a great snowshoe for recreational applications. Atlas 10 Series snowshoes come with the company’s proprietary V-shaped frames that have the tails tapered at the back. Such design offers superior maneuverability on hard pack and groomed trails as it’s lightweight and keeps snow buildup to minimum. However, it sort of compromises the snowshoe ability to float above the snow surface. This doesn’t really matter on most typical snowshoe trails but as soon as you break off trails and head into deep fresh powder in the backcountry, your feet will start to sink. There are three size options for Atlas 10 Series: 25, 30, and 35 inches. If you can’t tell which size is right for you, generally you can go with this rule: the heavier you are, the bigger snowshoes you need. 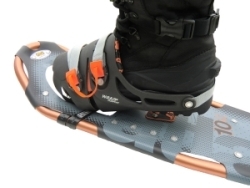 Snowshoe size has a direct effect on its capability to float, so choose wise. Take a look at our snowshoe sizing guide for more info. The traction system on Atlas 10 Series snowshoes is adequate for most moderate terrain. 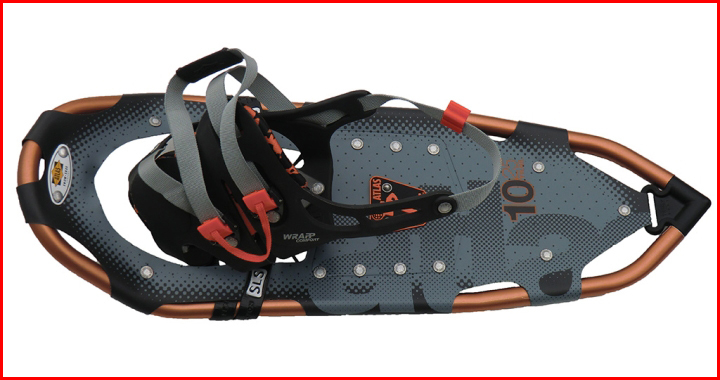 The toe crampons feel solid with steel construction in entirety. The heel crampons, on the other hand, are made of thick aluminum pieces. They go both parallel and perpendicular from the frames to optimize the vertical and horizontal traction for downhill trip and traverses respectively. As reliable as they are, such traction system isn’t designed to tackle serious steep slopes. The instep crampons may grip hard on hard pack across any rolling terrains but they just lack the aggressiveness to dig deep into the snow on some challenging ascents. The bindings on Atlas 10 Series can be a little annoying to deal with. They feature a large pad that covers most of your outer foot, instead of your arch like the bindings in Tubbs Mountaineer. This pad is connected to two webbing nylon straps that are secured using ratchet buckle. What’s annoying from them is they tend to curl in, making it quite a hassle to insert your boot in. Also, the hook to clip the loose straps isn’t very practical. You will occasionally find the straps catch on something on the trail. Release clips are not glove friendly too, so it’s more work to take off the snowshoes. Fortunately, the impracticality of the bindings is made up with the security. There’s a toe locator at the front of the attachment that helps you find the best position to place your feet. Once you tighten the straps with the ratchet buckles, they’ll stay in place for a long time. You may need to readjust them in your journey, depending on how challenging the terrain is, but it’s very rare that they’d go loose completely. If you think you’re a patient type of person and can deal with the minor annoyance of the bindings, Atlas 10 Series snowshoe would make a good company for you. Still not convinced? Find out how Atlas 10 Series snowshoes fare compared to other snowshoes in our list Top 10 Best Snowshoes of 2017.